One of the elements of the Hero’s Journey is the Door of No Return (DoNR). This comes after the Ordinary World where the main character is introduced, and we see them in their natural environment. That happens in Act I. The DoNR is the catalyst that propels the character into Act II. Often in stories, the DoNR is hard and fast. For Dorothy (Wizard of Oz, 1939) it was a literal door that she stepped through, never to return to Kansas in the same manner. The characters in Jumanji: Welcome to the Jungle (2018) were sucked into a video game and had to figure out how to get back home…and to themselves. In the Mountain Between Us (2017), the two main characters, Alex and Ben, were involved in a plane crash on a remote mountain range. In each case, the road back is impossible by the same means of which they came. Lion, is this type of story. Five-year-old Saroo, is separated from his older brother at a train station in India. He tries to look for him and boards a vacant train through, go figure, a door. This train takes him far from home to Calcutta, where they speak a different language than Saroo. He can’t tell them he’s not an orphan street child as they suspect. 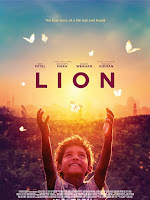 We see five-year-old Saroo in his Ordinary World with his mother and siblings, happy and loved, despite their poverty. 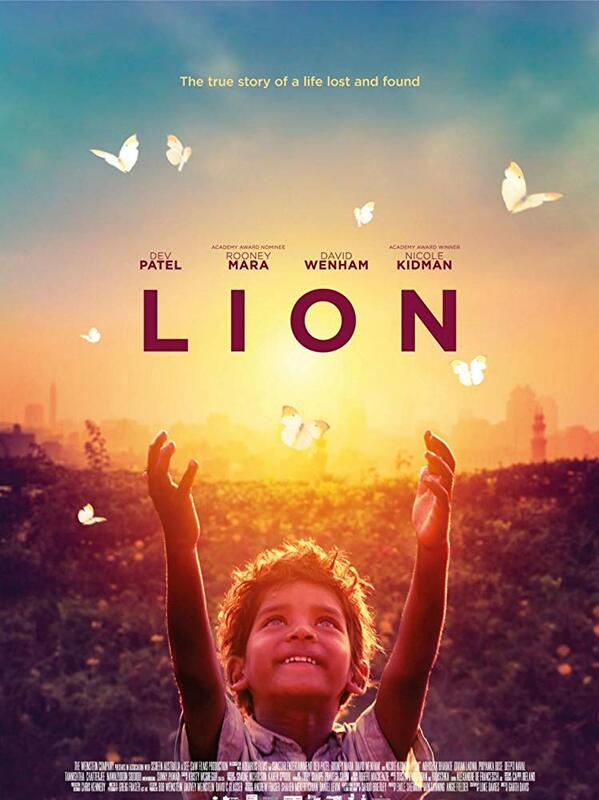 He gets the Call to Adventure when his older brother must go to a job in another town and Saroo wants to go with him. His brother, Guddu, acts as his Mentor as he helps him with his goal. They travel by train to where Guddu’s job is and his brother tells him to sit on a bench and stay until he returns. Saroo falls asleep. When he wakes, he notes the nearby water tower and assesses basically where he is. But his brother is nowhere near. He goes looking for Guddu instead of staying put as he was told. There’s an empty, open train and he decides to look for his brother in there. He Crosses the Threshold through the Door of No Return, literally. The train, apparently empty because it needs repairs, begins to move, trapping Saroo inside and doesn’t stop for over a thousand kilometers until it reaches Calcutta. Saroo finally runs into a nice woman who takes him in, feeds him, gives him a soft bed, and takes care of him overnight as if he were her child. He thinks he’s found a safe haven, but it turns out this is the Approach to the Inmost Cave where severe danger lurks. The nice woman is really a child slave trader. NOTE: After successfully going through the Ordeal, Saroo is now on his journey back. Picture the Hero’s Journey as a counter-clockwise circle. He starts at the top, takes a dive around the left side of the circle until he ends up in the Cave, then begins to climb back up the right side of the circle to where he started, albeit changed. Saroo is finally found by someone who can help. He’s placed in an orphanage, where it’s not pleasant, but it will be the catalyst to him finding normal again. He’s adopted and receives his Reward. His short goal, or first Outer Goal, was to be safe and he’s achieved that. Just as Dorothy’s short goal was to survive the Wicked Witch, Saroo has been concentrating on not dying on the streets of Calcutta. However, his Inner Desire, to be reunited with his family, has not yet been met. Once he’s placed in the home of a lovely Australian couple, he begins The Road Back. And this propels him into the third Act where resolution is achieved. During The Road Back, Saroo grows up in Australia, his native language slowly fading. He becomes a man of sterling character, happy and healthy. His subconscious awakens bringing back the memories of his childhood. He tries to find his home on Google Earth, but there are too many little villages and he doesn't know where to start. He eventually finds the water tower at the train station where he was separated from his brother, but it takes him two more years to meticulously trace the myriad of tracks leading away in a one-thousand-kilometer circle. He zooms in on the countless villages hoping to spot familiar landmarks of his home. This leads to his Resurrection. During his search, he has dropped out of school, cut off family and friends, and has become obsessed. One day, he’s confronted by his ex-girlfriend who helps him reconnect. He invites her and his parents to his apartment to reveal what he’s been doing. They assure him they love him and are okay with him trying to find his other family. With renewed hope, he continues his search. One night, he decides to look outside of the circle on Google Earth. He spots a hillside that he remembers and a river where he used to swim. Excited, he sees the name of the village is Ganesh Talai. He’d been pronouncing it incorrectly, calling it Ganestalay. He travels there and begins asking about his family. He finally sees his mother and they are reunited. His Inner Desire has finally been met. He Returns with the Elixir, the Hero’s Journey term for achieving his goal. The hero in our journey has started in one place emotionally and ended in a different place. Yes, he’s older, so obviously that would have happened anyway, but Saroo wouldn’t have been the same person as an adult had he not endured so much throughout his life. He now has a different perception of who he is. The Door of No Return is a great catalyst. Often, the books I read or the movies I watch, (or the first drafts I write, gulp!) don't have this important aspect of character development. Without it, we stay in the protagonist's Ordinary World and we don't see him challenged. Not so with Christopher Robin (2018,) who had to follow Pooh through the tree trunk before his paradigm could shift. Thor had to be transported to the junk planet to be taken down a notch (Thor: Ragnarok - 2017.) And Paddington (Paddington - 2014) had to find himself lost in a London train station far from his native Peru in order to learn about the world. Not all instances of the DoNR are literal. Elle Woods would never have earned her undergraduates degree from law school if her boyfriend hadn't cheated on her...with her rival (Legally Blond - 2001.) Ron Hall wouldn't have moved into an undying friendship with a violent homeless man had his wife not insisted on volunteering at the shelter and pushing him into helping (Same Kind of Different As Me - 2017.) Doors are important. Shove your protagonist through them, kicking and screaming. They'll be better off for it. The point of this exercise is to show that every story needs structure. The Hero’s Journey is the most popular outline, spanning centuries of story-telling. A good structure in our stories assures the reader of an emotional ride, leaving them haunted with the beauty of the story, as was my case. Yes, Lion is coming home with me.